« Sweet Potatoes or Yams for the Holidays? Are you getting a sugar overload just thinking about all the holiday sweets? Sometimes a slight change of pace delights the palate while cutting a few calories. Here’s a tempting salad or dessert to satisfy taste buds yet cut down on sugar. It looks festive and tastes great. Try this flavorful choice for children and adults alike. Dissolve lime gelatin in 1 cup hot water. Add 3/4 cup cold water. Pour into a 9″ X 13″ clear dish that has been sprayed with cooking spray. Dissolve lemon gelatin in 1 cup hot water. Add softened cream cheese and marshmallows and blend with a stick blender until smooth. Chill until consistency of egg whites and fold in drained pineapple, mayonnaise, and whipped topping. 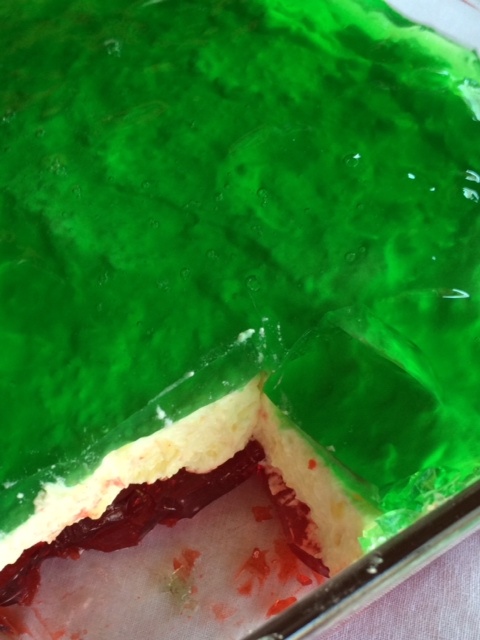 Gently layer the mixture over the congealed lime gelatin. Dissolve cherry gelatin in 1 cup hot water. Add 3/4 cup cold water. Let partially congeal and spoon on top of the firm lemon layer. Refrigerate six hours or overnight. Serve on a bed of lettuce as a salad or on a dessert plate as a dessert. On this Christmas Eve 2013, may you and yours enjoy a blessed holiday as we celebrate the true meaning of the season.